Stocks have been in a bull market for nearly five years. Think that's way too long? Think again. The stock market bulls have had the upper hand on the bears for nearly five years, and they may be just getting started. Sunday marks the fifth anniversary of the day the stock market hit its lowest point during the financial crisis and Great Recession. The fact that the rally is about to turn five has some investors wondering if stocks can keep going much higher. But previous bull markets, which are broadly defined as a period where the S&P 500 gains 20% or more without a decline of 20% in between, have gone on longer than the current one. 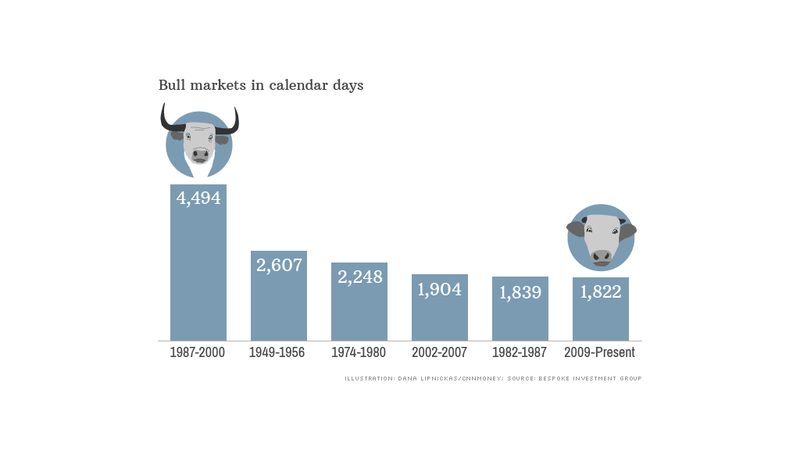 As of this week, this bull market ranks as the sixth longest since 1928 -- just behind the bull market from 1982 to 1987, according to Bespoke Investment Group. If the S&P 500 hits a new high any time after March 22, this bull market would become the fifth longest. Assuming it continues to rally through Memorial Day, the current run would be longer than the bull market from 2002 to 2007, when the housing bubble inflated. But this bull market has a long way to go before it becomes the longest -- that honor goes to the epic rally that began shortly after Black Monday in late 1987 and lasted until the tech crash of 2000. This bull market also isn't the best in terms of stock market performance either. As of Tuesday, the S&P 500 had gained 177% since March 2009, making it the fourth strongest bull market, according to Bespoke. The S&P 500 would have to rise another 20% before it will top the bull market gain from 1982 to 1987, when stocks surged nearly 230%. That's unlikely to happen, but it's not out of the realm of possibility. So can the rally continue for a sixth year? Of the 11 bull markets that have occurred since World War II, only three have made through a sixth year, according to Sam Stovall, chief equity strategist at S&P Capital. But Stovall thinks there's a "good chance" the current bull market will defy history and make it to its sixth birthday. That's partly because stock valuations are still reasonable, he says. The S&P 500 is trading at 16 times 2014 earnings estimates. That's not cheap. But it's not overly expensive either. Assuming the economy continues to grow and corporate earnings increase as expected this year, Stovall believes the bull market can last another year. He's not alone. A survey of 30 market strategists by CNNMoney in January found that most are expecting the S&P 500 to end at 1,960, up about 6% for the year. While that would be a healthy gain, it's a far cry from 2013's 30% increase. Jeffrey Kleintop, chief market strategist at LPL Financial, sees no signs the rally will end soon either. "In fact," he said, "the bull market may be getting a second wind." Kleintop argues that stocks will continue to hit new highs as investors who have been sitting on the sidelines jump back into the market. 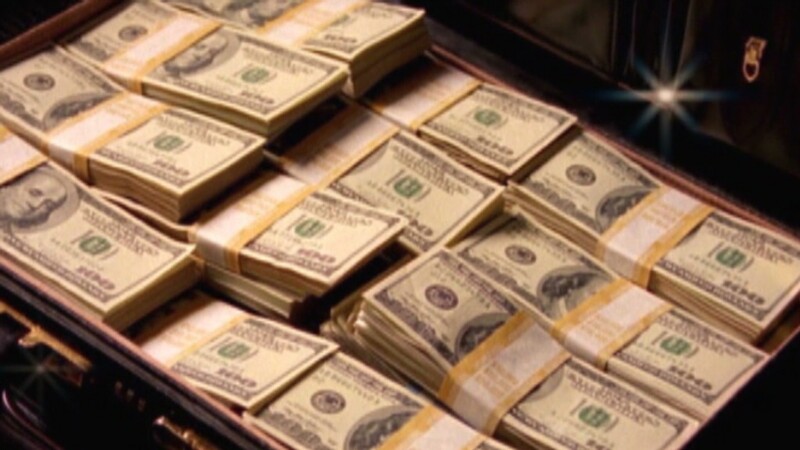 He thinks more investors will come to realize that returns for stocks are likely to exceed safer assets such as bonds. Looking further ahead, Kleintop says current market valuations suggest stocks can produce "mid- to high-single-digit gains" over the next ten years. That's not including dividends, which could add another 2%. Of course, even the bulls concede that stocks could suffer some setbacks. Kleintop says stocks will be volatile over the next ten years and there could even be another recession and big market pullback along the way. But for now, many experts think the bear is going to remain in hibernation mode for the remainder of this year.